Expert Mobile Car, Van And Motorhome Alarms And Security Installations Across Edinburgh, Fife, Lothians And Borders since 1988. Creates an Invisible Protective Bubble Around Your Vehicle. The ultimate in external protection! This sensor creates A Fully Adjustable invisible zone ( normally set at anything from 6 Inches - 3 feet from vehicle shell ) That if Entered will Cause An Alarm To Give a Series Of Warning Beeps Designed To warn away potential thieves Or Vandals who may be inspecting your vehicle. 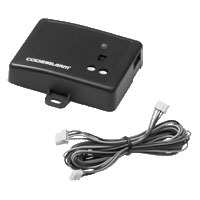 This Type Of Sensor Is Ideal For Vehicles Parked On Driveways. *Note : this price applies if installed at the time of original alarm installation. please note that the "protective bubble" around your car is invisible and harmless. The picture used is for illustration purposes only.